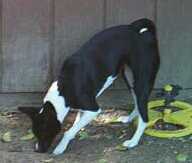 Rally is our second basenji and our first black and white. She was born on December 30, 2000 at Sherwood Basenjis in Georgia, and came out to live with us in California in March 2001. Rally made herself right at home when she arrived and fit perfectly into our family. She loves to share a patch of sun with Nicky. She also likes to sing for friends and family. She is a wonderful cuddler and loves to keep us company when we work in the backyard. 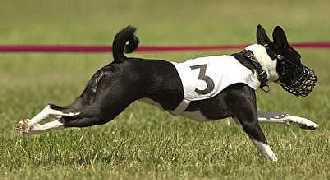 Rally made her show debut at the Coyote Hills Kennel Club shows in July 2001 going Reserve both days. She has enjoyed both showing off and clowning around in ring. She finished her AKC championship January 6, 2003. Rally is more than just a pretty face. She started her ASFA lure coursing career in February 2002 and earned ASFA Field Championship on August 18, 2002 with four best of breed wins. 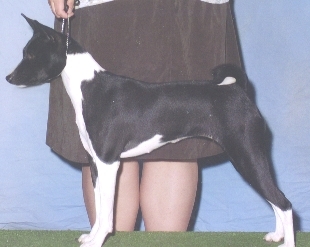 Rally earned a 5 point major at her first AKC lure trial in June 2002 and finished her her title December 8, 2002, after 5 trials with a total of 18 points including two more 5 point majors. She is also an LGRA straight line racer and a NOTRA oval track racer. She earned her Junior Oval Racer title on May 4, 2003. Rally is also training for agility, watch what a team she and Sam make.